When we hear stories about wildlife rescue, the accounts typically tell of species like elephants, or tigers, or macaques, or bears, or other well-loved and well-known species. Rarely do we hear about the plight of hyenas. I remember the first time I saw wild hyenas. We were on safari in Kenya after the 2000 Meeting of the Conference of the Parties to CITES held in Nairobi, and our Land Rover emerged from a thicket of trees to see four or five hyenas lurking around the base of one very big tree. We gawked, amazed... how big; how powerful; how intriguing. Then, I looked up and saw the leopard in the tree with a fresh kill! The scavengers we watched with such joy were lingering for cast-offs from the leopard's meal. To Born Free, not only do entire species matter, but individual animals matter. That's why we rescue hyenas-an orphaned cub left behind when his mother was killed, a baby who fended for himself after a flood washed him out, a hyena who had been confined to a zoo-and rehabilitate them in a spacious enclosure. 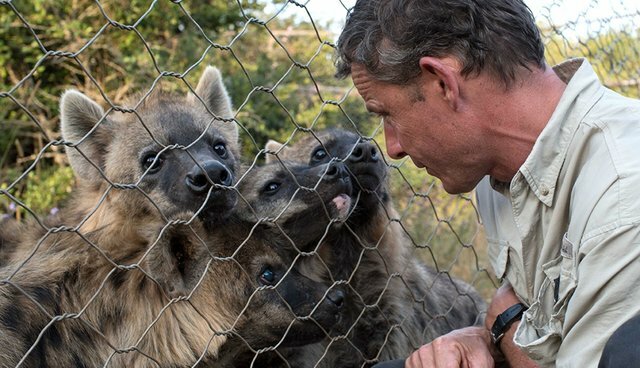 Hyenas are highly social, so the interaction that they experience at the rescue center is crucial to their recovery. Once they grow to be self-sufficient, we will release them back into the wild, if possible. In the wild, hyenas only number in the tens of thousands. And, the hyena's biggest threat? Humans. Hyenas often prey on livestock, so as prevention-and in retaliation-farmers shoot, trap, snare, or poison hyenas, or even hunt them with dogs. Humans also destroy the hyena's habitat, and our encroachment goes so far as to reduce the habitat available to the hyena's prey. Hyenas are also poached for their supposed superstitious and medicinal benefits, such as use in traditional healing and as an aphrodisiac. With your help, we can ensure that these hyenas have the chance for healthy, happy lives: first at our center, and then, hopefully, in the wild. That's where they belong, and we will do our absolute best to return them there-safe and strong. Let's hear it for the hyena!